A tiger cub was found shot in the legs in a Russian forest, and now people are doing everything they can to save her. A criminal investigation is underway to find out who illegally shot this rare Siberian tiger cub, who is now currently being cared for at the Amur Tiger Centre in Moscow. 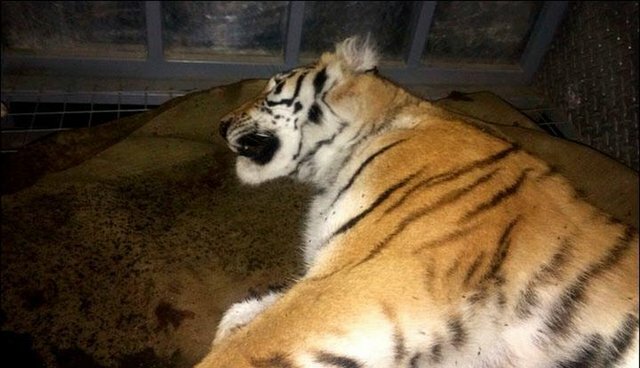 "At the moment, the vets have done everything possible ... We want to believe she will make it," said Sergei Aramilev, director of the Amur Tiger Centre. "Now it is the question of life and death." Because of habitat destruction, ruthless poaching and trophy hunting, there are only about 500 of these beautiful tigers left in the wild. Caretakers are worried that the mother of the cub was likely killed by poachers for the profits her skin would bring on the black market trade to China. Aramilev added that it is too early to talk about the injured cub's future and whether she will end up in a zoo or be released back into the wild. Learn what you can do to help tigers in need here.